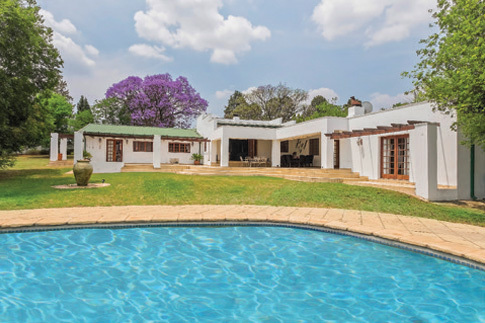 Experience best of both worlds with this lovely country home in Chartwell North. Set on 2 acres of land, you can own a piece of the countryside right on the edge of the Fourways node. The spacious kitchen is in a French provincial style with a cream coloured feature retro gas topped stove and a movable butcher’s block. The separate scullery has plumbing for two appliances. A huge dining room leads to a bar / lounge with open beams and a wood-burning fire place. This opens out onto a large patio overlooking a crystal circular pool. Another formal lounge also leads to the patio through sliding doors that provide an ideal entertainment space for all occasions. There is a large library / study / TV room with built in cupboards. There are two fair sized bedrooms and two bathrooms as well as an additional study at-tached to one of the bedrooms. All have plenty of built in cupboard space and pristine wood laminate flooring. The master suite is huge and features a walk in wardrobe, a paja-ma lounge and a large bathroom. It has air-conditioning and wood laminate flooring and double doors that lead out to a private patio with a pagoda. There is a separate income-generating cottage that has two good-sized bedrooms, 2 bath-rooms, a lounge / dining area and a lovely kitchen with a private garden and patio and it’s own access to the triple garages. The property is secured by electric fencing and has two staff units. It has a strong, fully automated borehole.